They were political allies but are now fiercely competing against each other in the March 15 Democratic primary for the state’s 1st Congressional District, which includes parts of Chicago’s South Side and suburban Blue Island and Frankfort. 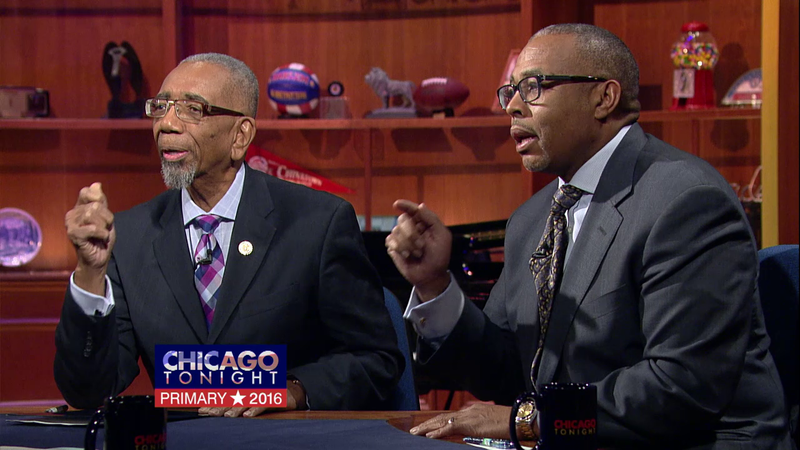 Longtime incumbent Bobby Rush and Ald. Howard Brookins (21st Ward) join Carol Marin to discuss the race and how they plan to bring jobs and other resources to the predominantly African-American district, which has previously been represented by influential black politicians like William Dawson and Ralph Metcalfe. Rush, a former alderman and Black Panther who was first elected to Congress in 1992, supported Brookins in his unsuccessful attempt to become Cook County State's Attorney in 2008. Prior to that, Brookins endorsed Rush in his 2000 re-election bid against a fresh-faced Barack Obama. But whatever friendship they once shared appears to be over. Brookins attempted to have Rush removed from the March primary ballot by claiming he did not have enough valid signatures on his nominating papers. The Illinois State Board of Elections in December disagreed, and both candidates appear on the ballot along with O. Patrick Brutus, an employee with the Chicago Department of Community Development. Brutus did not respond to an invitation to participate in Monday’s forum. Running in the Republican primary for the 1st Congressional District are August O’Neill Deuser and Jimmy Lee Tillman, II. Both Rush and Brookins addressed the rift in their friendship during a heated discussion. Brookins said he formerly supported the Congressman, but said that support has faltered in recent years. Rush, however, cited health issues and family illnesses as part of the reason for his absences. Bobby Rush Bobby Rush is the incumbent Congressman for Illinois’ 1st District and has served since 1992. He also served as an alderman for the 2nd Ward starting in 1983. In Congress, Rush has emphasized legislation for low- and middle-income communities, consumer protection, health care and Wall Street reform. He sits on the Energy and Power Subcommittee, the Communications and Technology Subcommittee and the Commerce, Manufacturing and Trade Subcommittee. Rush is a veteran of the U.S. Army and has a Master’s Degree in Theology. He and his wife, Carolyn, have seven children. Howard Brookins Howard Brookins has served as Chicago’s 21st Ward Alderman since April 2003 and is now in his fourth term. He is the Chairmen of the Committee on Economic, Capital and Technology Development and was formerly the chair of the Chicago City Council Black Caucus. Brookins has worked as an assistant public defender, assistant state’s attorney and special assistant attorney general. He continues to practice criminal defense law. Brookins is a father of two boys and his father, Howard B. Brookins Sr., was a former state senator and Chicago police officer. O. Patrick Brutus Brutus has served the past nine years as Coordinator of Economic Development for the City of Chicago in the Department of Planning and Development. He also worked in the Neighborhood Development Division, the Housing Preservation/Neighborhood Stabilization Program and the Workforce Development and Business Development division. Brutus also worked in the Illinois Department of transportation for 11 years. In the past, Brutus has emphasized livable communities and sustainable economic development through infrastructure projects. Brutus completed his graduate studies at the University of Illinois at Urbana-Champaign. He is married and has three children. The 1st Congressional District is home to 717,741 residents. Of those residents, 366,890 identify as black or African-American, 294,595 identify as white and 71,357 identify as Hispanic or Latino. Below, see how residents identified themselves in a 2014 American Community Survey. Of the population, 572,443 are estimated to be age 16 and over, with the unemployment rate estimated at 13.8. The average income per household is $64,298 according to the U.S. Census Bureau. Below, see the income and benefits (in 2014 inflation-adjusted dollars) per household. Hear from two of the three Republican candidates running on March 15 to unseat 11th District Democratic Congressman Bill Foster.